It's a great idea to learn a thing or two about your destination before you fly off on your escape. Put a mark near Kithnos on a map now and start getting excited for a memorable adventure! 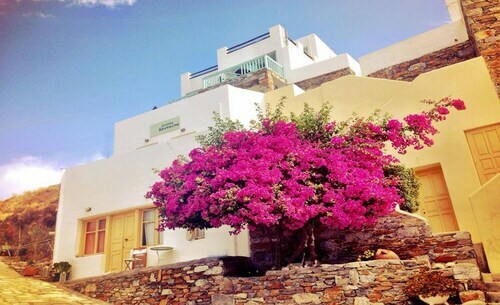 You'll find it in Cyclades Islands, 30 miles (48 kilometers) away from Patroklos. Kithnos airfare and accommodation packages can be easily arranged via Travelocity, and you won't believe how much you'll save. Just select from upwards of 400 airline partner companies and 665,000 lodgings. Our Customer 1st Guarantee offers the security of 24/7 personal assistance on everything from accommodations and airfares to rental cars and activities. Have you stumbled upon an even better bargain? We'll match the price and refund the difference^. With no cancellation fees from us, you won't need to stress about changing your vacation plans. And so long as you get in fast, most accommodations won't charge you either^. No one wants to get lumped with an uninspiring room (or even worse, no room at all!) That's why you should plan your Kithnos accommodations early. Flick through its 6 properties and book as soon as possible. If you're looking for someplace indulgent to spend your nights, slide between the silky sheets at the S4 Sun by K4 Kythnos (Kanala). 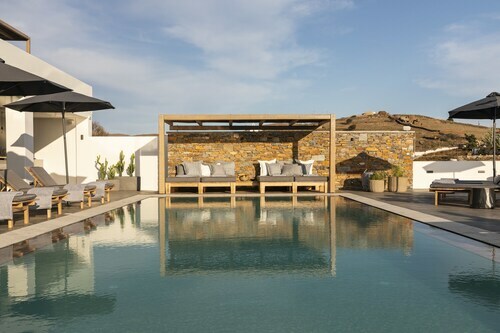 Alternatively, hit the hay at the Kythnos Bay Hotel (Loutra, Cyclades). It's a superb choice if you're on a smaller budget. Where do you fly into for Kithnos? Luggage and passport ready to go? Great — hop on the plane to Eleftherios Venizelos Airport (ATH). Once you land, you'll be only 45 miles (72 kilometers) from the heart of Kithnos. Can I rent a car in Kithnos? Considering a road trip during your stay in Kithnos? A rental car will definitely be helpful here. Search through some of the options on Travelocity, pick your favorite and hit the road! No matter if you're looking for a boat trip on the bay or simply a charming view, you're in for a treat with Loutra Bay. This curve of land and sea is guaranteed to relax and refresh your spirit. Still need more options? If you're in the mood for some spiritual enlightenment on your getaway, swing by Church of Panagia Kanala. Who knows, you might even find the answers to some of life's greatest questions! If you've explored the best offerings of Kithnos already, don't fret. You've actually got iconic attractions right around the corner! Tourists from all across the globe flock to the Parthenon. You can access it from Athens, 55 miles (89 kilometers) away. 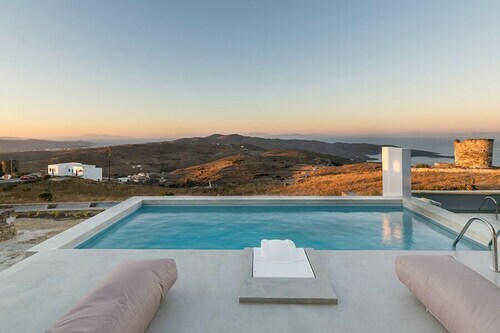 Located in the heart of Kithnos, this apartment building is 0.1 mi (0.1 km) from Port Merichas and within 9 mi (15 km) of Church of Panagia Kanala and Loutra Bay. Gialiskári Beach and Kea Port are also within 32 mi (52 km). Situated by the sea, this hotel is 0.1 mi (0.1 km) from Loutra Bay and within 12 mi (20 km) of Port Merichas and Church of Panagia Kanala. 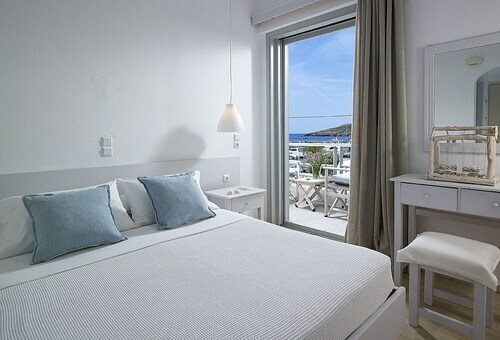 Situated in Kithnos, this hotel is 2.5 mi (4.1 km) from Loutra Bay and within 9 mi (15 km) of Port Merichas and Church of Panagia Kanala. Kea Port and Saint George Church are also within 32 mi (52 km). 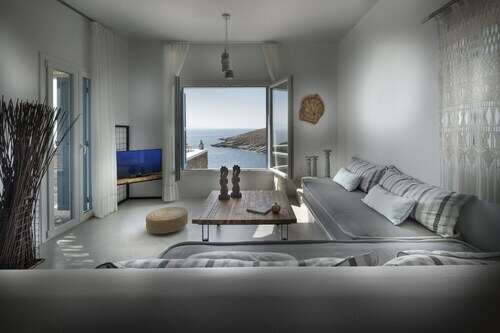 Situated in Kithnos, this aparthotel is 0.1 mi (0.2 km) from Port Merichas and within 9 mi (15 km) of Church of Panagia Kanala and Loutra Bay. Gialiskári Beach and Kea Port are also within 32 mi (52 km). Situated by the sea, this apartment building is 9.4 mi (15.1 km) from Church of Panagia Kanala and 11.9 mi (19.1 km) from Port Merichas. Loutra Bay is 15.3 mi (24.7 km) away. 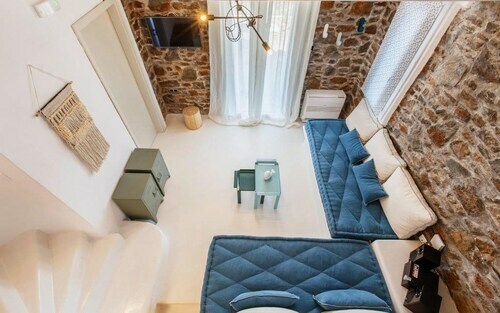 Situated in Kithnos, this apartment building is 3.8 mi (6.1 km) from Church of Panagia Kanala and within 12 mi (20 km) of Port Merichas and Loutra Bay. Agios Nikolaos Lighthouse and Gialiskári Beach are also within 32 mi (52 km). Situated in Kithnos, this romantic villa is 7.2 mi (11.6 km) from Church of Panagia Kanala and 9.6 mi (15.5 km) from Port Merichas. Loutra Bay is 13 mi (21 km) away. 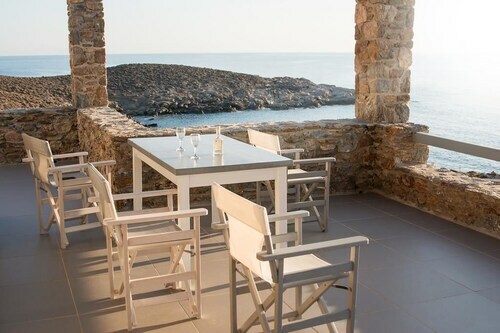 Situated in Kithnos, this villa is 3 mi (4.9 km) from Church of Panagia Kanala and within 9 mi (15 km) of Port Merichas and Loutra Bay. Kea Port and Saint George Church are also within 32 mi (52 km).